Ramadan Kareem to all of those who are celebrating it, er fasting. Anyways, I want to start a recipe series for Ramadan, but really can be used any time of the year. These recipes will be quick, easy, and plant-based. I will include recipes that are easily digested and energizing for futoor (the meal we break our fast with). For suhoor (a meal that's eaten right before dawn or the last meal we eat before starting our fast) these recipes will be filling and slowly digested to help you sustain your energy throughout the day. I figured that it's only right to start with a recipe that invloves dates. 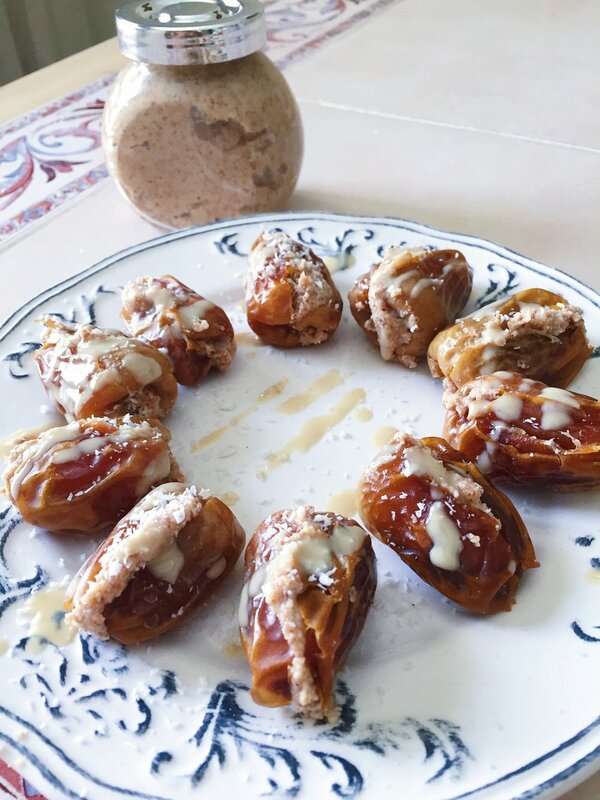 This recipe can be eaten for futoor or suhoor as it's simple but at the same time filling from all the nut butter inside the dates. Add the coconut to the food processor and process until it turns into butter. It will take about 10-15 minutes. Keep scraping the sides as needed. Add maple syrup if you want, but I liked the butter to be a bit bitter so it goes well with the dates.